No matter what kind of party you are going to hold, a wedding or a corporate event, the theme color is always the first problem. Attractive colors can leave people unforgettable first impression and overall sense. However, white party tents are always the first choice. As the king of color, white means pure, elegant, and noble, especially ideal for wedding. Most people chose white color as theme color for their weddings without doubt. Not only inside lining or curtains, but also the roof cover and sidewalls are all white. This is what makes white party tents the best choice. 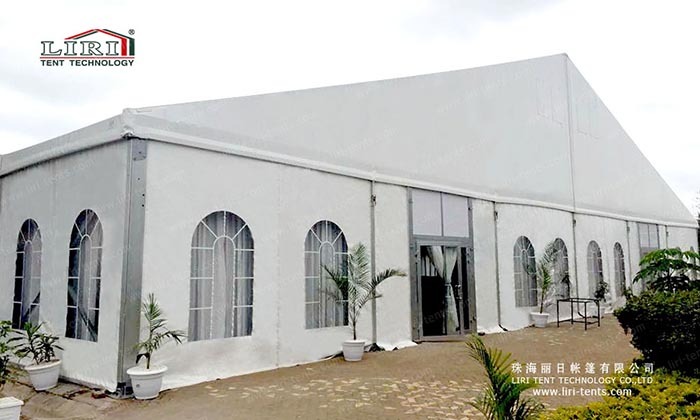 As the first and largest party tent manufacturer in China, Liri Tent has been supplying many white tents for wedding and party. We received lots of positive feedback from our clients, which encourages us a lot. If you want to have a memorable party, we strongly recommend our party tents white for you. If you want to know more about this white party tent, just SEND your detailed product inquiry. We will get back to you as soon as possible.